Congressional Airport was located in Rockville, MD. Started in 1928 as a training facility, it was the closest airport of the three to Chet’s home in Chevy Chase, MD. Chet prepared for his pilot license by training at Congressional; his instructor was Al Reynolds. 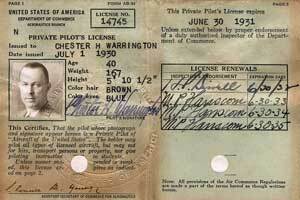 Chet’s pilot’s license, his ticket to the adventure of aviation. It is interesting to note that Congressional’s manager, R.H. Clement, didn’t get his license until June 1932, even though he flew during World War I.
Chet with his two loves and livelihoods, the airplane and the car. 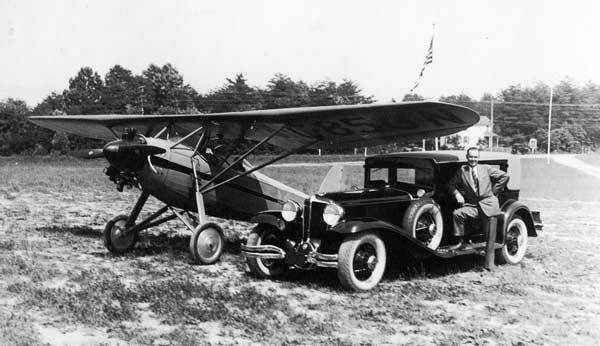 Photo taken at Congressional Airport in May 1930. The plane is a Davis D-1; Chet was a Davis dealer as well as a Stinson one, and he took his pilot’s licence test in a Davis. His Davis “lot” was at Congressional. In the 1930’s it was the scene of all kinds of flying demonstrations; however, Chet’s attention turned elsewhere, and Congressional Airport figures little in our story after 1930.